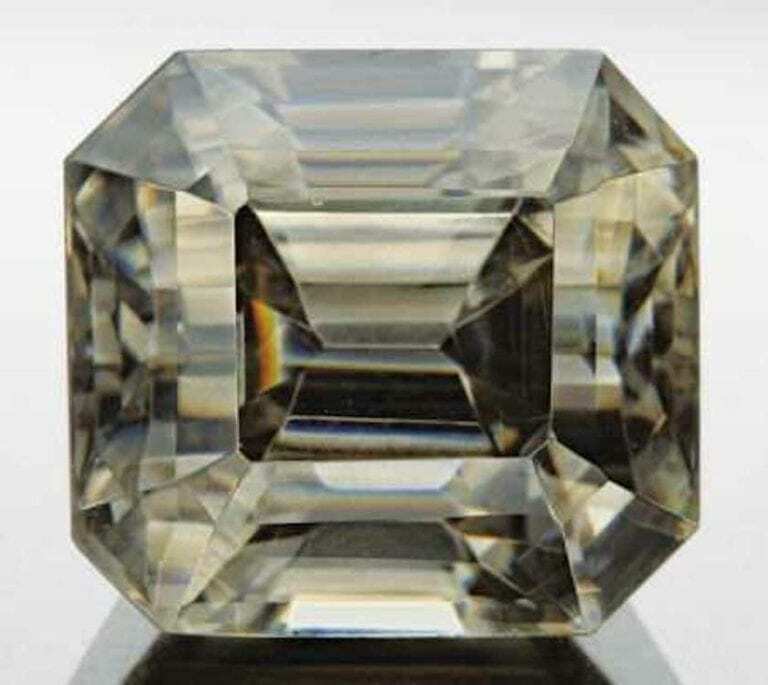 I’m a neophyte gem cutter and I have a real fundamental question about gemstone orientation. 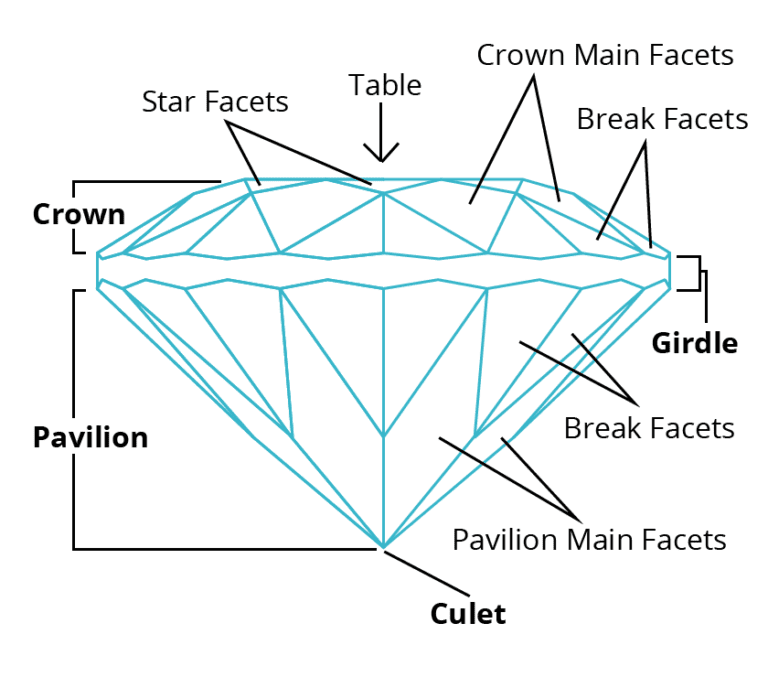 How do you decide which way to orient a stone when it is cut? 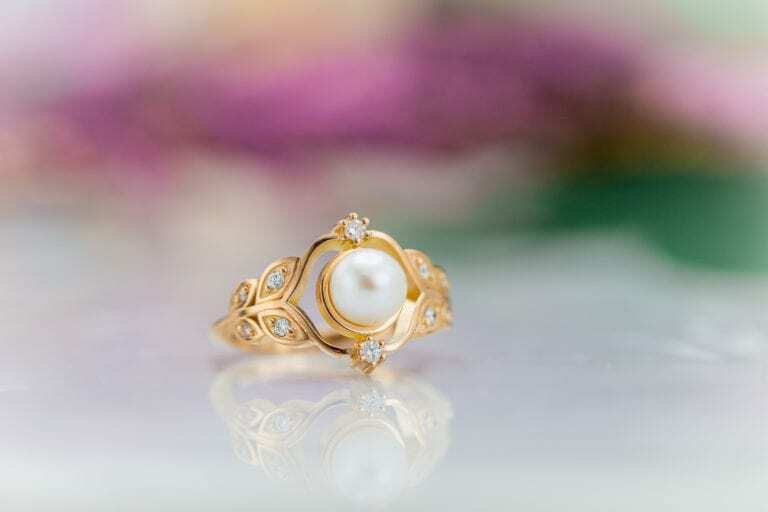 Do you need a specific shape for the stone? For dichroic rough, what direction gives the best color? What is the shape of the rough? How many flaws are you prepared to tolerate in the finished stone, and where should the flaws be placed for least visibility? Where are the cleavage planes, and how are you going to avoid them? Last, but not least, how expensive or rare is the material? I try to see what sort of shape is suggested by the rough. Try to identify where the table might be and see how much depth is available. Visualize the different positions for the table plane and stone axis. Try to imagine what size and shape could be fitted into the piece. Narrow the possibilities to a few options. Making a decision about table placement is critical. Most things follow from there. My preference is to go for maximum recovery in expensive rough, even if it means the stone has a few tiny flaws. Cutting flawless stones can be expensive. You may end up with a lot of small stones. 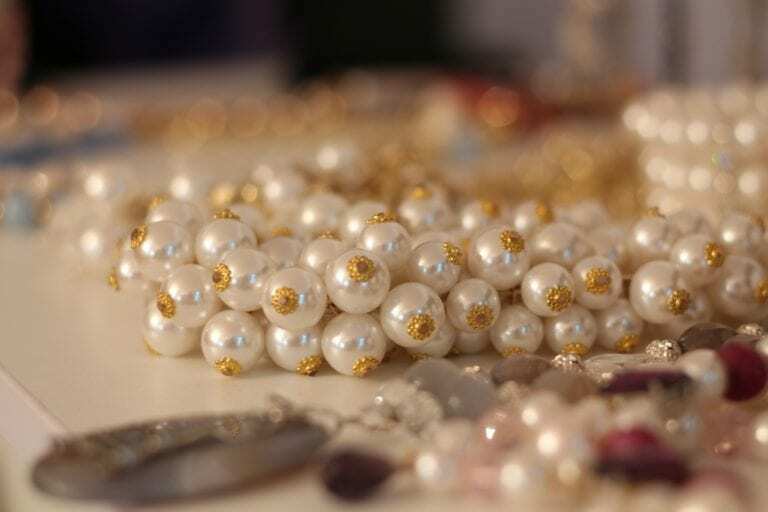 For general jewelry wear, a few small flaws won’t affect the appearance of the piece. Of course, if the material is cheap, you can afford to be more critical. That’s one reason why it’s a good idea for beginners to start with relatively non-directional things like quartz, synthetic sapphire, and garnet. I’ve recently cut tourmaline, iolite, and topaz. Understanding the reasoning behind my gemstone orientation choices might be helpful to a beginner. 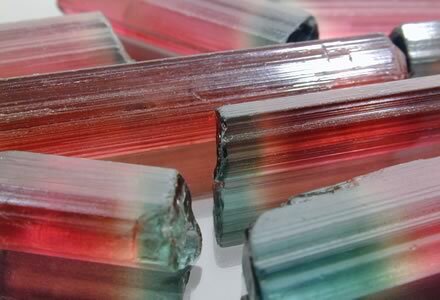 I received a batch of orange-pink tourmaline with well-developed crystals that were virtually emerald-cut preforms. 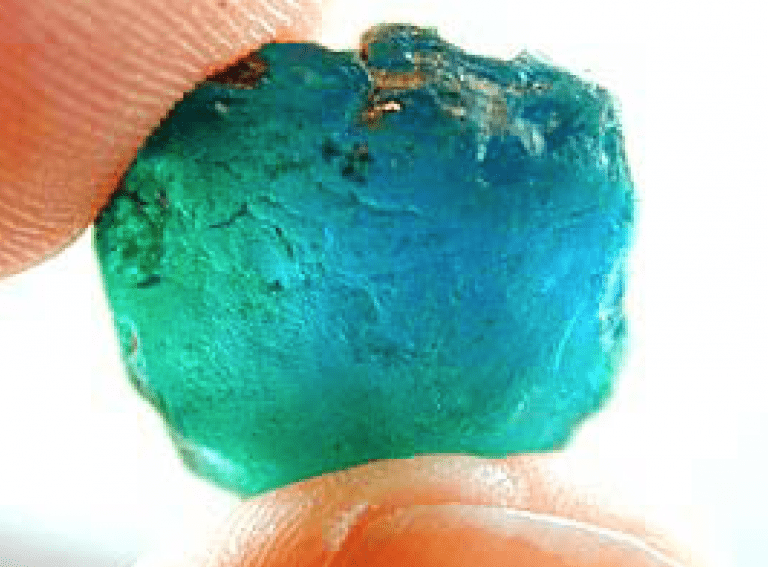 The orientation was obvious, but I kept in mind the well-known fact that most tourmaline has a deeper color looking down the C axis (the long axis). However, cutting with the table across this axis would have meant slicing into a large number of small triangular stones. That was a silly idea. In practice, the obvious cut worked well. The internal reflection picked up the C axis color, and the stone had a good shade when finished. (In green tourmaline, it’s almost obligatory to cut with the stone axis perpendicular to the C axis. 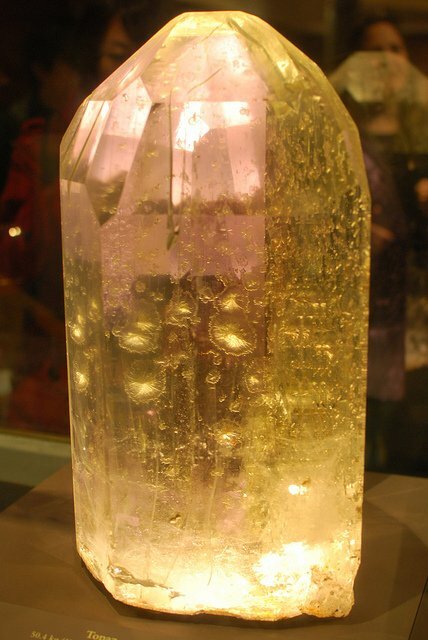 The color viewed down the crystal can be so intense as to be opaque). A few small flaws appeared near one end of the orange-pink stone as I started to rough it out. I was undecided on how much to shorten the crystal. Eventually, I decided to leave them in since they would be below the end facets and not visible through the table. Of course, if I had decided that they were objectionable in the final stone, I could have recut it smaller. This material commonly has only one axis with a strong purple. The others are pale purple or yellow/brown. 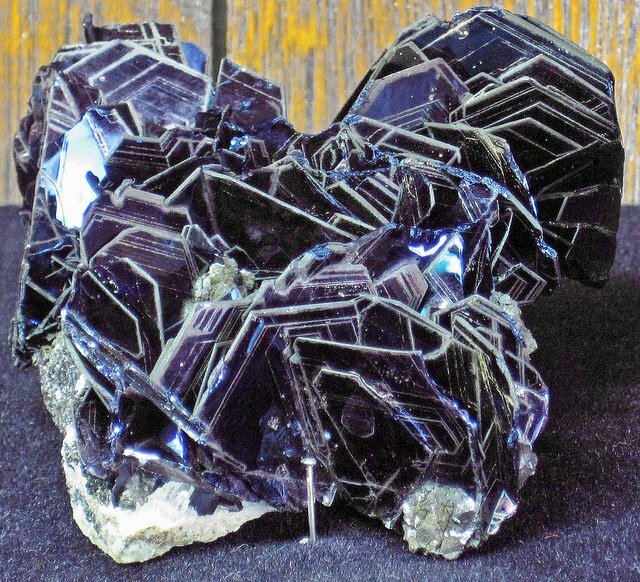 However, the cleavage is such that it often comes in thinnish pieces with the dark color on edge. Again, I didn’t try to cut it for the depth of color. I cut across the axis. Again, the internal reflection picked up the color. The result was a much larger stone of a steely mid-lilac color. In my opinion, this was far more attractive than the dark conventional cut which attempts to emulate sapphire. This material also had flaws. 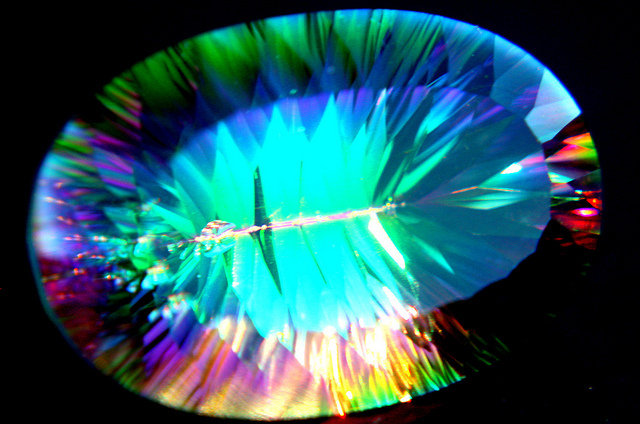 Many of the stones in my batch had veils that would pick up the light only at certain angles. I ignored all but the worst of these. As I suspected, they were invisible to the eye in the final stone. (Although a glass reveals them clearly). I had irradiated material with a patchy brown color that was good down the axis but poor across. Since I had to watch out for the cleavage plane, there was only one choice. I had to tilt the table to the cleavage plane by 5º or so. The final color was much warmer and more uniform than the rough suggested. 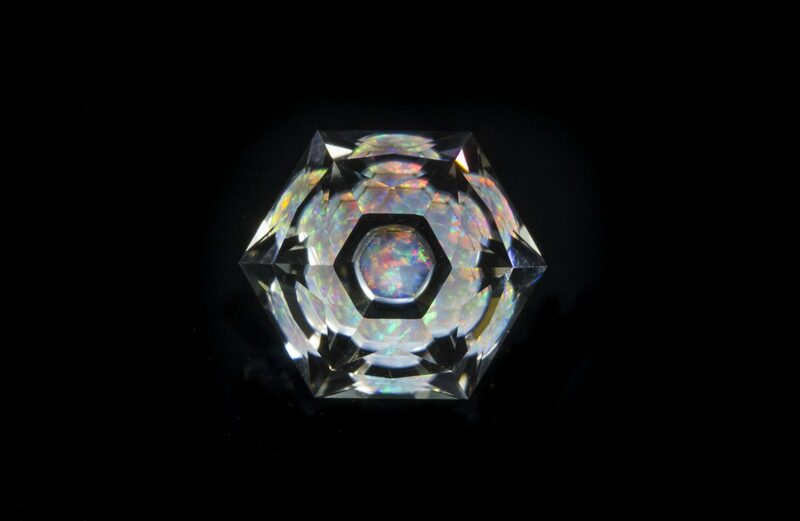 For all three stones, cutting at the correct angles allowed light to be reflected within the stone at many angles, thus mixing up the color. So color problems in the rough are often not apparent in the finished stone. Additionally, I had the luxury of being able to cut fancy shapes and non-standard sizes from my rough. This made my job easier. 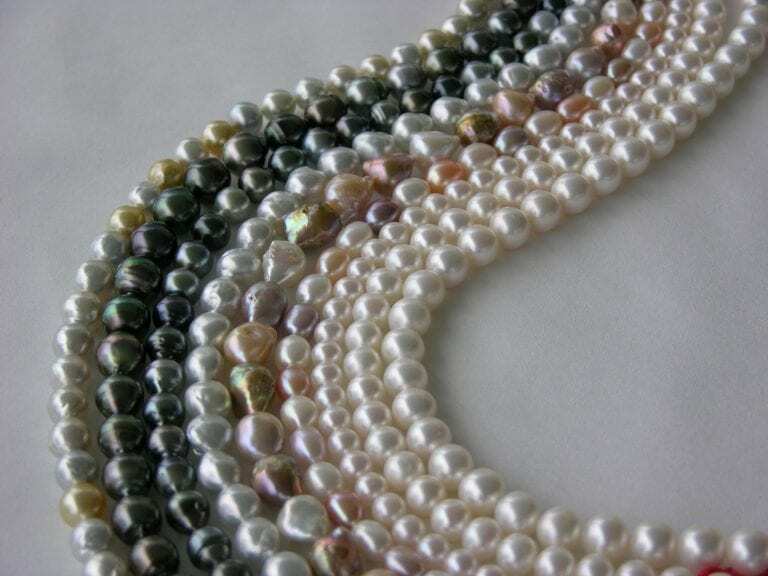 If you need a particular size and shape, then you may have to sort through several pieces of rough to find one that will work.